The smash is the main attacking shot used in volleyball and is probably one of the hardest moves to master. The smasher can vary the smash by smashing cross court, down the line, hitting of the block and hitting a controlled speed block. As always the players tactical ability to decide which one to execute will determine whether they are an effective attacker. To prepare for the smash the player must drop off of the net so the setter can set the ball in front of the smasher. When jumping, both feet should be together to stop the player from jumping forward into the net. 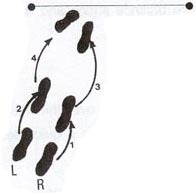 The four step approach is usually used as shown on the left. The arms are swung forcefully backwards and the knees are bent. The power of the jump is a mixture of the arm swing and straightening of the knees and hips. The approach should take the smasher to the place where the jump will be made before jumping. The hitting arm is drawn back behind and to the side of the head, the arm then straightens at the elbow when jumping with the hand moving from the side of the head to the position of above and slightly in front of the hitting shoulder. When making contact with the ball it is important to remember the hand should be slightly cupped and contact with the ball is with the palm of the hand slightly in front of the hitting shoulder.